Premium Stainless Steel ID Tag, D - Style. 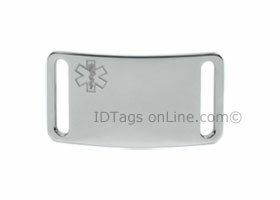 Sport ID Tag, IDTG24 (ID Tag size 1-5/8" x 7/8"), is made from .062" thick premium grade Stainless Steel. It is guaranteed to be rust free for the life. Engraved medical logo is located on the left side of the plate. The tag is the replacement for wrist bracelets. It is slightly curved for wrist wear.